New large GreenWell is now available. Designed and produced to meet the needs and specification of the commercial urban tree specialists. All of the key benefits of the standard size GreenWell have been retained. GreenWell has also been awarded the Smart Approved Watermark, in recognition of the products ability to assist in water conservation. The new GreenWell comes as three separate parts that “zip” together in the same way as the original smaller version. 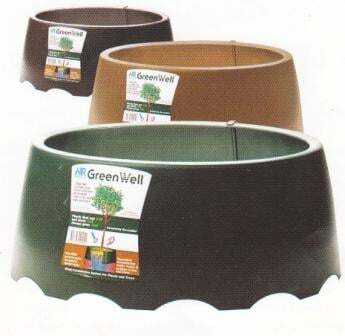 The final assembled GreenWell holds twice the water capacity of the original, is 250mm high and 600mm diameter at the top and 670mm diameter at the base. GreenWell is made from recycled plastic, is reusable and available in either traditional green, black or terracotta.